NEW YORK—”Always hear of something going on,” Isi Diaz said of the East New York neighborhood where his uncle and father’s laundromat operates. 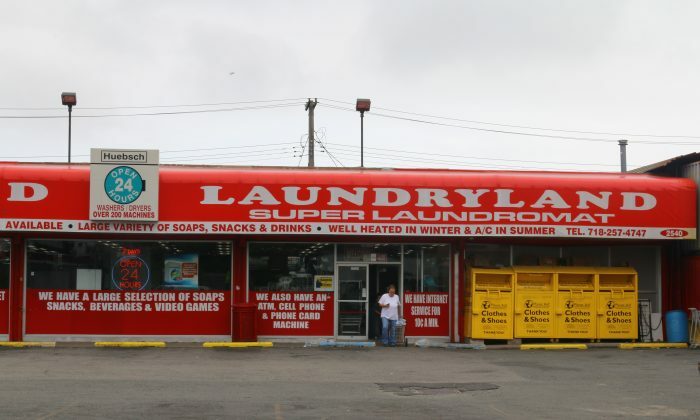 Diaz has managed Laundry Land on Linden Boulevard for nine months. Three men tried to rob Laundry Land on March 18. It was one of 12 laundromats hit in a spree of robberies and attempted robberies since January. Eleven of the robberies occurred in Brooklyn. “About 3 a.m., three guys came in with masks and gloves,” Diaz said. The night worker and two elderly women were in the laundromat at the time. The night worker ran to the back room and locked himself in. After failing to break through the back room door, the thieves tried unsuccessfully to access the front counter. “They weren’t able to take anything,” Diaz said. The two women present have not returned to the laundromat since the event. Since the attempted robbery, the doors of Laundry Land no longer remain open overnight. Despite the heightened police presence in the area, Diaz still doubts the general safety of the neighborhood. “Someone’s always getting shot or killed, especially back there in those projects,” Diaz said. The most recent hit in the spree occurred near midnight on June 7 at the Express Laundry on Caton Avenue in Brooklyn. A surveillance video shows one unmasked suspect standing by the door as a look out. According to police reports, in most cases, three suspects, including one armed with a gun, have entered businesses and taken money from the register and customers. There have been no reports of injuries. “Young people don’t have nothing to do!” said Priscilla Mathews, a 20-year resident of the East New York who is worried about the safety of her foster daughter.